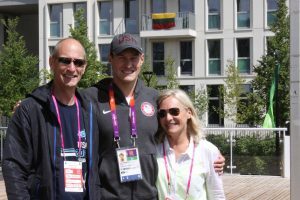 About the Author: Robin Vanderkaay is the mother of four incredibly talented sons, all of whom have competed at the Olympic Trials. Most notably, Peter Vanderkaay took home medals for the U.S. in Athens 2004, Beijing 2008 and London 2012. The sport of swimming has played a major role in the lives of each member of our family. My husband and I met through swimming. We both swam competitively in college, and when the boys were very young, we started them in the water (mostly, just for fun and exercise). Our goal was not to steer them into the competitive sport; that developed on its own. They loved the water and had natural talent at young ages. We actually told friends that there was “no way“ we would end up sitting at swim meets but ended up in the bleachers for many years anyway! 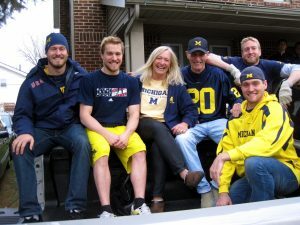 Each of our sons, Christian, Peter, Alex and Dane, all swam for a local age group program and then competed for the University of Michigan. They all swam at Big Tens and NCAA Championships. Alex went on to represent TEAM USA in two World University Championships and “Duel in the Pool.” Peter competed in the many World Championships, “Duel in the Pools” and the 2004, 2008, and 2012 Olympics, winning two gold and two bronze medals. 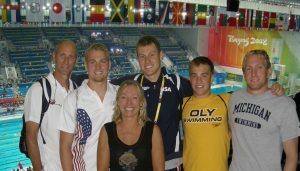 Looking back, one of the most exciting accomplishments came with all four boys competing at the 2008 Olympic Trials in Omaha. We got our money’s worth with those tickets. 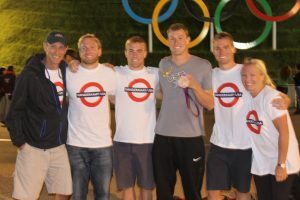 The success the boys had in the pool came with a huge commitment from them individually and us as a family. We did not start this adventure with the goal of college scholarships or going to the Olympics. The focus was enjoying the sport, which included working hard and setting goals for improvement. Along the way, the guys participated in other sports. When young, they skied and played soccer, baseball, tennis and golf. We encouraged them to try all these fun sports and it was not until they were in middle school that they totally committed to swimming. Having all the boys in swimming helped make it more of a family event. Most vacations were planned around prelims and finals! Swimming is a tough sport. Training is intense and time consuming. But we tried our very best to keep it fun! We centered our social lives around other swim families and made sure we had activities that did not hinder training. When the boys were young, we had no problem taking time off and just doing family things. Once they were in high school and very committed to training, this was much harder to do. We were very fortunate to have a fabulous age group program and a great coach who stayed with the program. His advice on swimming, life lessons and goal setting was invaluable. To this day, we credit him and his wife with helping raise our boys! We never interfered with the training aspect and always felt that should be between the swimmer and the coach. Our philosophy was to leave the “coaching” to the coach and only ask advice as to how to support our swimmer. If the boys ever had an issue or disappointment with the sport, they went directly to their coach. Our job was to support them, keep it fun, make sure they were accountable, and have them know we were proud of them for the journey. Support is making sure they can get to practice, eat healthy, get their sleep, and have the resources to go to travel meets, etc. Support also involves the athletes knowing you are there for them whether they attain their goals or not. 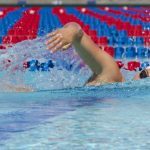 It is easier to keep it fun when the results are good but much harder when your swimmer is upset with results or training. After a disappointing swim meet, we always found a really good restaurant! Eating healthy was one of the biggest components of the sport and we focused on healthy, timely meals. We incorporated the healthy meals to be readily available before and after practice. This was often a challenge but a very important part of the training. The accountability comes with making a commitment and sticking to it. This means making a commitment to the coach and team and then following through with it by going to all the practices, budgeting time for family and church, meeting school deadlines and hanging out with friends. Not always easy to do! The sport of swimming is an excellent lesson in time management! Success in this sport depends on desire, hard work, talent and support. The athlete has to truly enjoy it and be motivated from within. A very famous swim coach once told us, “A happy swimmer is a fast swimmer.” That was the best advice ever given!